In sin, you ate. For all the wrong raisins. When the wind is fair, the wheels have left the runway and the electronic devices have been turned off and stowed, it’s time to turn to one of flight’s more subtle pleasures. There exists a publication that believes that it’s more in touch with the needs and desires of the population than the population itself, that is more cognizant of the uses of modern technology than Scientific American, a publication who’s ratio of advertisements to purchases is so very low as to be homeopathic. I refer, of course to “Sky Mall” magazine. I don’t know which of the boys was the first to bring up this temple to ad-hoc artisanary; I suspect the Dodgy One, since he flies more often than the rest of us. However, the first time it was mentioned it became apparent that we all had read it, had never bought anything from it and are mystified with respect to the target audience. Is there really a significant population of people who will buy life-size statues of fishing grizzlies to decorate their gardens? Bear in mind that enough of these objects d’art have to be sold to justify the ink spent in thousands of magazines. How jolly it must be, the first time you see a polyurethane Ursus arctos horribilis fishing in your pond, and how tiresome the one hundredth. I imagine that these men have wives. What do they say when the Sky Mall crate arrives and Yogi is installed? How many marriages has Sky Mall dragged over the reefs of matrimonial disappointment? One thing is certain: No woman would ever order such a thing. The boys like to argue. A lot. About Anything. Think of outrage as rage expressed outwardly, verbally or through actions. The opposite, “inrage”, is the quiet, clenched and desperate suffering that is the reaction of normal people to life’s frequently obnoxious trials. We are forced to inrage every day, and without the opportunity to outrage, we’d all suffer stress illnesses and die from digestive disagreeability. And as with all human endeavors, some people are just better at outrage than others. The Prime Minister of Outrage is Bucky, a man of promiscuous irritability. He is more than capable of holding two quite violently contradictory opinions at the same time. Bucky will express one or the other of these, choosing the opposite view to that held by the person in closest proximity. To Bucky, outrage is a purpose in itself. Just as there is no real, practical reason to ski or golf, beyond the enjoyment experienced, to him, outrage is its own reward. Bucky’s outrage has fashions. His mode du jour is Dodgy’s propensity for avoiding lunch, using an excuse that speaks of manly standards broken, of sides let down ingloriously. I speak of HandBag Dogs. Handbag dogs are a mystery. In London, tame hawks are used to control the pigeon population, and there are news reports claiming that purse pooches occasionally provide practice for these working raptors. So they do have their uses. True, the creatures may be acquired through no fault of one’s own, through marriage or bequest, but no boy, dreaming of a doggy pet, ever wanted one small enough to fit in his satchel. I can believe that you may acquire one by accident, purchasing a puppy, then cursing the purveyor when it refuses to grow. I imagine too, that sometimes Nature’s unhappy dice rolls snake eyes, and a dwarf canine Richard III is delivered into an otherwise noble parentage. However, in Bucky’s eyes, Dodgy’s dreadful sin was is to willingly purchase, with knowledge aforethought, this diluted dog, this wee peewee. I think that in time, Bucky would’ve forgotten this transgression, or even allowed his wrath to wax upon other members of the lunch consortium, had Dodgy not excused himself from our lunch meetings because he had to take the iWoof Nano for a lunchtime walk. Small indoor dogs, smaller bladders, and the poor Dodge is reduced to making an eight mile round trip for puddle prevention. Bucky has named the process “Widdling”, and Dodgy’s obvious soft spot for his pup, together with his refusal to apologise for the missed meals threatens the stability of the sub-culture that is the boy’s lunch. So it’s left to me to provide a solution. And by golly, do I have one. 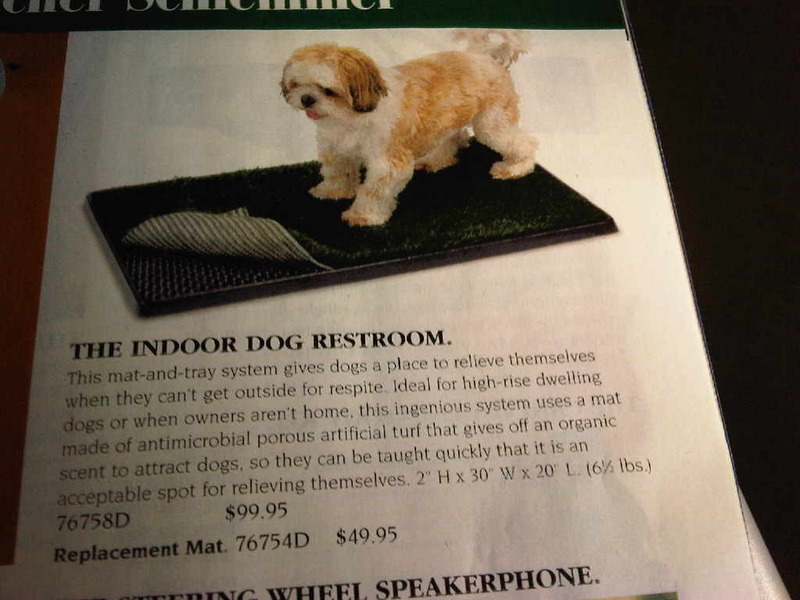 I consulted the Sky Mall magazine and came across this ingenious invention. What brilliance! The future may not have provided the flying cars that we were promised, and cities on the moon and under the ocean are further away than ever. But now, thanks to Sky Mall, Dodgy can have his Caesar Salad (with dressing on the side) at lunch with the boys without having to say to his dog: “urine trouble”. This year’s “Piggies” are to be awarded on May 14th at Page’s Chinese Theatre, Southampton at 7pm. In case you haven’t guessed, an award will be given for each of a number of very well thought out categories, broadly related to misadventures in Telluride. I think everyone’s already seen the trailer below, but I believe that it looks cool sitting there, twiddling its thumbs. The long-awaited ski movie will be shown. Dress is occasional, but this is not an invitation for the Porcine One to show up in the buff.